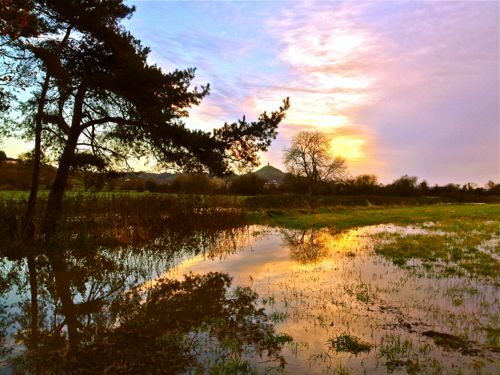 The UK has been battered by torrential rain during November with the west country being particularly badly hit. I’ve enclosed some pictures taken near to my home in Street, Somerset. The rivers and streams have been unable to cope with the downpour, leaving roads closed and lakes where fields once were. I was particularly saddened to see some of the farm animals still out in fields, stranded on what little land remains visable above the water. These pictures were taken between November 23-26, 2012. The fields between Street and Glastonbury, Somerset. Beautiful but frightening new landscape.